Ex-Trump Campaign Chair Charged With Conspiracy Against US and Offshore Account Violations! 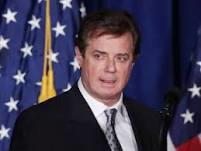 According to Law360, President Donald Trump's former campaign chairman, Paul Manafort, and an alleged co-conspirator have been indicted on charges of conspiracy against the United States, money laundering and bank records charges tied to close to a decade of secret lobbying on behalf of Russia-associated Ukrainian officials. The indictment comes as the first charges to emerge from the probe by special counsel Robert Mueller, the former FBI director who took over the investigation of Russian interference into the 2016 presidential election in May following the firing of FBI director James Comey. 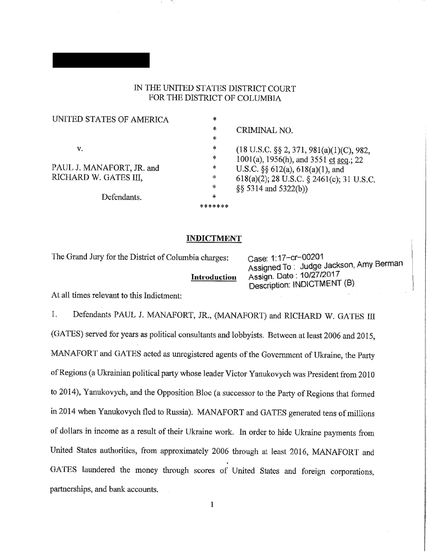 The 12-count grand jury indictment alleges that Manafort and business associate Richard W. Gates III received as much as $75 million for secretly advocating on behalf of the party of former Ukrainian president Viktor Yanukovych, which they hid through international money transfers. According to the indictment, Manafort and Gates acted as lobbyists for the Party of Regions from 2006 onward, receiving payments that they routed through shell companies in Cyprus, the Grenadines and the United Kingdom to assets in the United States. Manafort and Gates acted essentially as undeclared lobbyists on behalf of the Party of Regions, according to the indictment. “Manafort, without reporting the income to his tax preparer or the United States, spent millions of dollars on luxury goods and services for himself and his extended family through payments wired from offshore nominee accounts to United States vendors,” the indictment says. Manafort set up companies called Davis Manafort Partners and DMP International LLC in 2005, which were held by Manafort and his wife and which Gates worked for, according to the indictment. The Party of Regions, a pro-Russia party in Ukraine, hired DMP in 2006 to advocate on its behalf, according to the indictment. That continued when Yanukovych was elected president in 2010 and after he fled the country in 2014 and the Party of Regions rebranded as the opposition, according to the indictment. The party allegedly paid Manafort and Gates through that period, and eventually through the European Center for a Modern Ukraine, a party-funded mouthpiece that was founded in 2012. The indictment alleges that Manafort and Gates contracted two D.C. area lobbying firms during a multimillion dollar lobbying campaign, telling them they would be representing the government of the Ukraine. The two men allegedly directed lobbying to members of Congress and the administration on behalf of Ukraine without declaring as foreign agents. According to the indictment, Manafort and Gates used more than a dozen international entities to funnel money into the United States. Manafort allegedly used foreign money to purchase U.S. property, which he then borrowed against to obtain cash. The indictment’s 12 charges include conspiracy against the United States for having “intentionally conspired to defraud the United States” Treasury Department and DOJ, money laundering, failure to file foreign bank records, acting as an unregistered foreign agent, false statements under the Foreign Agents Registration Act and false statements to investigative officials. Want to Know if Which OVDP Program is Right for You? Another Offshore Law Firm Gets Hacked! On September 5, 2017 posted How Will the IRS Know About My Foreign Account? where we discussed that Taxpayers who have financial assets outside the United States often ask the question "How will they (IRS) know about my Foreign Account? ;" when they are considering how (or whether) to come clean and inform the IRS about their previously undisclosed foreign financial accounts. 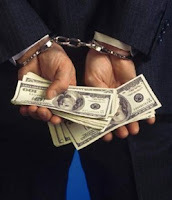 Since 2008, a string of scandals involving foreign banks and investigations by the U.S. government into various non-U.S. financial institutions has garnered international media attention and changed the way governments around the world deal with offshore financial accounts. The Super-rich clients of offshore law firm Appleby are bracing themselves for the exposure of their financial secrets, after the firm admitted data had been stolen in a cyber attack last year. The Bermuda-based law firm admitted it was "not infallible" and said some client data had been stolen in the hack, but denied any wrongdoing. The International Consortium of Investigative Journalists (ICIJ) has since approached the firm with allegations of wrongdoing, after it was handed data obtained in the hack, which Appleby strongly refutes. Appleby said in a statement it did not tolerate "illegal behaviour," and said the ICIJ's allegations were "unfounded and based on a lack of understanding of the legitimate and lawful structures used in the offshore sector." Marini & Associates, PA has assisted several hundred clients with coming into U.S. tax compliance and avoiding the draconian penalties that the IRS may impose on U.S. persons with undisclosed foreign accounts. Do You Have Undeclared Foreign Income? We previously posted on December 1, 2016 Panama Papers - Global Effects Thus Far & Continuing Impact where we discussed that on April 4, 2016 we initially posted Huge Leak From the Panamanian Law Firm Mossack Fonseca! discussing that the offshore planning world was set on fire with the news that 11 million documents were leaked from the Panamanian law firm Mossack Fonseca. Nine Mossack Fonseca offices have shuttered around the world, and the law firm has been fined close to half a million dollars. Now the Panama Papers has taken a Human Toll! “My mother was assassinated because she stood between the rule of law and those who sought to violate it, like many strong journalists,” Matthew Caruana Galizia, who is also an investigative reporter, wrote in a moving and at times graphic Facebook post. 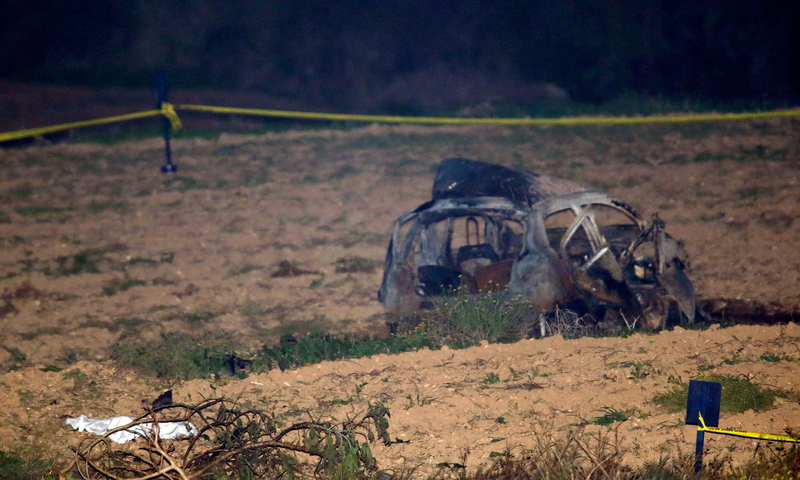 Dutch forensic experts and a team from the FBI were due to arrive in Malta to help police in the EU’s smallest state investigate the killing of Caruana Galizia, who led the Panama Papers investigation into corruption on the island. What Happened to the IRS OVDP Website? 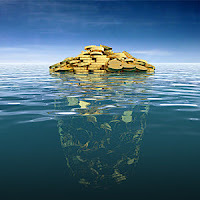 Where you represent as many taxpayers as we do in relation to cleaning up their previously undeclared offshore investments and bank accounts, your are on the IRS' website daily to review the current elements required by the IRS to qualify for an OVDP filing or an OVDP streamline filing. (See www.OVDPLaw.com). You can imagine my surprise when my desktop link to each relevant IRS OVDP page, that I've been using for the last 8 years no longer worked. According to the IRS "Within our tight budget constraints, the IRS has also continued to analyze and develop plans for improving how the agency can fulfill its mission in the future... In requesting adequate resources to allow the IRS to improve taxpayer service, it is important to point out that our goal is not to fund today’s staff functions at historically high levels. We need to be, and are, looking forward to a new, improved way of doing business that involves a more robust online taxpayer experience. This is driven, in part, by business imperatives; when it costs between $40 and $60 to interact with a taxpayer in person, and less than $1 to interact online, we must reexamine how we provide the best possible taxpayer experience, in response to taxpayer expectations and demands. So where can you the Tax Advisor now find the necessary links to determine what the IRS' current requirements for OVDP filing or an OVDP streamline filing are, as well as the requirements for late filed information return? Technical Positions taken at IRS Appeals or in Tax Court! 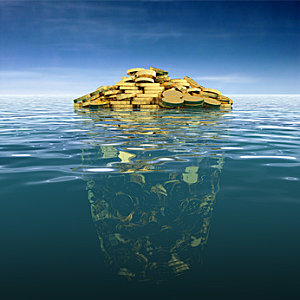 Do You or Your Client Have Undeclared Foreign Income?